According to a new release by Forbes 'Africa's 40 Richest', Nigeria leads and dominates the list with 11 entries. 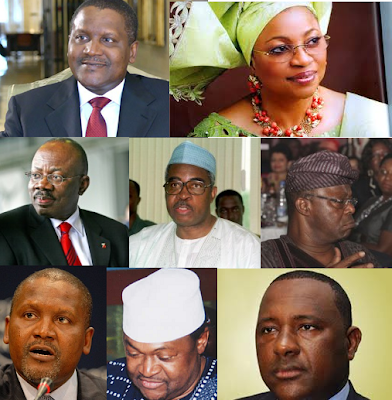 Take a look at the Nigerian's that made the list and their positions. #1 Aliko Dangote, Net Worth - $12B. He is the wealthiest Man in the Continent and the 76th billionaire in the World. Dangote Group deals primarily in Cement, Flour, Sugar among others. #5 Mike Adenuga, Net Worth - $4.6B. Adenuga owns Globacom Mobile Network and Conoil, which produces an estimated 100,000 barrels a day. #19 Jim Ovia, Net Worth - $825M. He founded Zenith Bank and as an ex-Chief Executive, he still has a stake of $300M in the company. He currently manages Visafone among other ventures. #21 Abdulsamad Rabiu, Net Worth - $675M. He heads the BUA Group which rakes in $1.9 billion in revenues and focuses on sugar, vegetable oil and flour among others. #24 Folorunsho Alakija, Net Worth - $600M. Clearly the Richest Woman in Africa. In 2000, the government unduly acquired a large percentage of her stake in a block but was victoriously reinstated back to her company, Famfa Oil by the court, early this year. #24 Theophilus Danjuma, Net Worth -$600M. Formerly the Defense Minster, his South Atlantic Petroleum Exploration company is the sole operator of a field offshore of Benin Republic. #26 Oba Otudeko, Net Worth - $575M. Founded Honeywell in the eighties. He has a stake in Airtel Nigeria and Radisson Blu. #27 Mohammed Indimi, Net Worth - $550 M. He founded Oriental Energy Resources and eight of his children serve on the board of his company. #31 O.B. Lulu-Briggs, Net Worth - $500M. He founded Moni Pulo Limited, an oil exploration and production company. His wife is a Pastor. #37 Sani Bello, Net Worth - $425M. Formerly Kano State Governor and Ambassador to Zimbabwe. He founded Amni Petroluem and has a minor stake in MTN Nigeria for which is the Vice Chairman of the Board. #40 Hakeem Belo-Osagie, Net Worth -$400M. He chairs Etisalat Nigeria with a controlling stake of 12%. He is known to have reportedly bought 51% of UBA from the government and sold it for $120M in 2004.